Athletes are more aware than ever of the importance of sports nutrition, and many know that they should be including post-workout nutrition as part of their routine. If they aren’t properly fueling and recovering with the nutrients their body needs, they may not see the success they are expecting. As a sports dietitian, I find far too often that athletes think that post-workout nutrition is all about protein and don’t realize the important role that carbohydrates, liquids, and electrolytes also play in this timeframe! Sometimes referred to as the “Three Rs of Recovery” (Refuel, Repair, Rehydrate), it is important that athletes include each of these components after finishing their workout. Carbohydrates provide our bodies with fuel to operate in the form of glucose and glycogen. During exercise, our glycogen (stored in the muscle) is used for energy. Therefore, it needs to be replaced afterward, so that the body is ready for the next training session. Replenishing these glycogen stores is especially critical for those who are exercising twice in a day or those without a consecutive day or two off to allow the body to rest and recover. 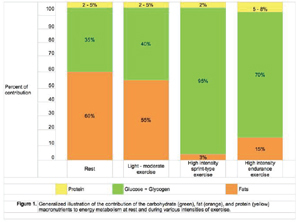 The amount of glycogen used does depend on what type of activity is done. For example, endurance training uses much more than resistance training, so a cross-country runner would use more glycogen stores while running compared to lifting weights. To replenish glycogen, there are two primary forms of carbohydrate: simple and complex. The athlete’s body responds differently to each of them. Complex carbs, like vegetables, do not cause the same insulin spike as simple carbohydrates, like sugar, and can be broken down and utilized by the body over longer periods of time. Simple carbs can provide a quick energy boost, while complex carbs help with building future energy stores. Exercise will inevitably trigger some form of muscle breakdown. However, the type of exercise and the duration will have an effect on the amount of protein damage in the muscle. Resistance training can create more damage than endurance training. To repair this damage, athletes should aim to consume 20 to 30 grams of protein post workout, although larger-sized athletes and those with longer and more aggressive sessions may require slightly more. In addition, resistance training recovery can be on the higher end of this recommendation. Replacing water and electrolytes lost through sweat in exercise is an important step that many athletes forget. Performance athletes can lose one to three liters of sweat per hour of exercise, which can translate to upwards of eight pounds lost. In that sweat is typically between 1.5 to 3.5 grams of total electrolytes—over 90 percent of which are sodium and chloride, or salt. That is why it is critical to replenish not just water after exercise but also electrolytes, mostly sodium. Muscles with higher water content can decrease the risk of tearing and injury. After activity, encourage athletes to choose water or an electrolyte beverage to continue hydration. For chronic crampers and heavy/salty sweaters with greater electrolyte needs, there are higher-concentration electrolyte solutions available like The Right Stuff®, developed by NASA, which can be added to water or a favorite sports drink. Beyond the Three Rs of Recovery, athletes must factor in what to eat and when following exercise. A general recommendation for most athletes is to consume a 3:1 ratio of carbs to protein. An athlete could start with 60 grams of carbohydrates and 20 grams of protein. A recovery option such as eight ounces of chocolate milk (25 g carbs + 8 g protein), Greek yogurt (14 g carbs + 12 g protein), and a banana (25g carbs + 0 g protein) would meet this 3:1 ratio. An endurance athlete may need a 4:1 ratio of carbs to protein. Regardless of what your athlete chooses to meet their carbohydrate and protein needs, they should consume it within 30 to 45 minutes after completing exercise so the body is able to immediately start repairing the muscle tissue and restoring glycogen levels. During this timeframe, the body is able to use the nutrients at a faster rate than hours following exercise. Keep in mind, this recovery snack can also be a meal if consumed within 45 minutes following activity. , For instance, many athletes work out in the morning and have breakfast after exercise. We encourage that they still meet the 3:1 ratio of carbs and protein and continue to hydrate throughout the day. Post-workout recovery is not a magic bullet to instantly improve athletic performance, but it will help promote muscle protein synthesis, keep energy levels high, and improve fluid balance – which should lead to a high-performing athlete!